Send "Smart" URLs That Know Who Your Constituents Are! Make giving easy with pre-filled links that allow donors to support your cause in seconds! By pairing your DonorPerfect system with SmartGive, you’ll simplify the donation process for constituents and keep your records up to date without lifting a finger. A SmartGive link takes donors to a secure online payment page that’s pre-filled with their address, phone number, email and other information, so they can donate quickly and easily. You can customize SmartGive links with your logo and offer multiple payment methods, including credit cards, debit cards and e-check (ACH) payments. All gift data flows directly into your DonorPerfect system. SmartGive is INCLUDED free-of-charge with your DonorPerfect Express, Essentials, or Premier system! 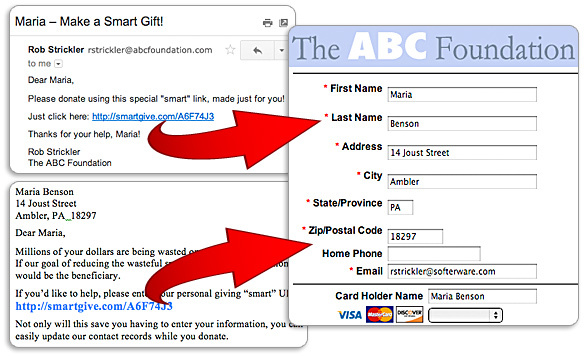 See SmartGive Pre-Filled Online Donations Links in Action! SmartGive isn’t just great for donors. Generating a SmartGive link is a snap. Just do a quick DonorPerfect mail merge to create SmartGive links for print and email solicitations. Pre-filled forms reduce typos and encourage information correction by donors and registrants, keeping your records correct and up-to-date. Send a printed SmartGive URL to collect missing or up-to-date email addresses. Or email to update postal addresses. SmartGive links display the latest up-to-date DonorPerfect data, even if the donor record was updated after sending it. Rest easy knowing that data encryption protects donors’ payment account information. 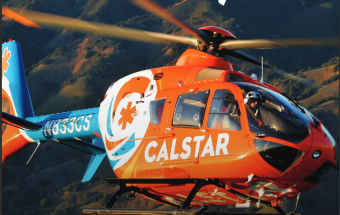 SmartGive has significantly increased both the number and timeliness of CALSTAR’s online membership renewals. Our supporters are receptive to using it because it’s quick and easy, which has resulted in less paperwork and physical payments for us to process. With our membership retention at a high level and reduced administrative work for our staff, SmartGive is a great benefit to our program!